Bouncy castles provide hours of fun and excitement for kids, it’s a perfect way to have a catch up with your family and friends whilst the kids are being fully entertained. 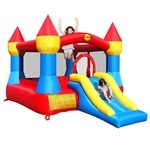 Our table shows the best kid’s bouncy castles for sale not for hire, you can see the pros and cons of buying vs renting below so you can decide which option is best for you. These bouncy castles for kids are for home use only, it cannot be used for commercial purposes. Nonetheless, you’ll end up saving a lot more money from after a couple of uses as renting twice would probably cost you more in some cases. The styles of each kid’s bouncy castles to buy can vary a lot from one to another, so choosing the best inflatable bouncy castle could be just a matter of preference. There is however other factors which may affect your style of choice, such as not being able accommodate enough users. Below we’ll go through the list of features applicable to a bouncy castle, explaining what to look out for. Maximum users – The recommended maximum number of children that should be allowed on at the same time. Maximum weight capacity – Also ensure the combined weight of the users on the bouncy castle doesn’t exceed the maximum weight capacity. Keeping within the limits will prevent damage to the bouncy castle and prolong its life. 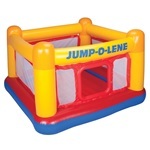 Indoor/Outdoor use – Some of the inflatable bouncy castles can be used indoors as well as outdoors. Please check the dimensions to ensure you have enough room to inflate the castle somewhere. 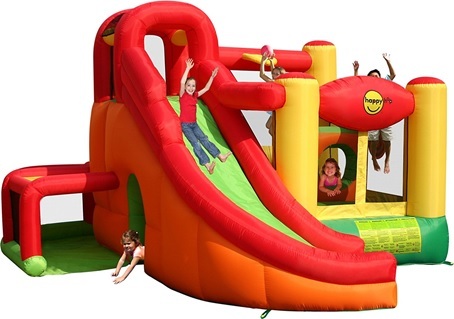 Material – Most of the kid’s jumping castles will be made from the same or similar materials. Inflated dimensions – Ensure you have enough space in your garden or indoors by checking how much space it’ll take once inflated. Extras – Some bouncy castles may not come with any extras, you simply use it to bounce around! 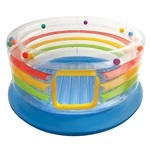 Whereas others will have extras such as a slide and ball pit to keep the fun going for even longer. Electric fan/pump included – Used to inflate the bouncy castle, if it doesn’t come with one then you’ll need to buy a pump separately. Constant airflow required – Usually the larger bouncy castles for kids require the electric pump to be constantly plugged in to provide constant airflow to the castle. If this is the case, then the electric pump and wire should be well hidden to prevent any potential injuries. Smaller bouncy castles can simply be pumped up, the pump can then be fully detached and taken away, it does not need to be constantly plugged in. You may need to top up the castle with air every few hours to ensure it remains fully inflated. If you’re unsure whether you want to rent or buy, then we’ve listed the pros and cons below so you can decide for yourself what’s more suitable for you. Saves you a lot more money. You can take it out and use it on short notice. No need to go through the hassle of ordering the bouncy castle and waiting for someone to deliver it. Quality may not be as good as a commercial standard one. Limited to having the same bouncy castle, whereas if you rent one you can pick a different style every time. Ideal for occasions such as charity events. More styles and sizes to choose from. You may be able to find a style appropriate to a theme such as a Frozen bouncy castle for a Frozen birthday party theme. Don’t need to worry about finding space for storage. A lot more expensive which you may need to pay an extra charge for delivery as well. Some companies charge for cancellations or they keep your deposit even if it’s due to bad weather conditions.